I first came to Kyoto University in April 2016 as a Research Scholar In the Graduate School of Management for 1.5 years. Then, in October 2018, I entered the Graduate School of Economics as a Masters Degree student. 1. The Ability to Interact with Many Entrepreneurs in the Graduate School of Management at Kyoto University! The Graduate School of Management at Kyoto University, (link) attracts a wide range of students, some of whom have their own businesses, or they are eventually going to take over their family’s business. Currently, I am taking a course called “Global Social Entrepreneurship and Leadership Styles” by Professor Sachiko Kuno and Professor Akiko Murai — both of whom are exceptional female leaders and role models in their respective areas. I will share more about them in a future article. In this course, I have already met a young Japanese man, who will eventually take over his family’s sake business. Thus, he’s taking courses at Kyoto University, to learn how to expand his business abroad. Another young Japanese woman, also runs her own business with her husband. And she’s taking the course, to better understand how to manage employees and strengthen her leadership style. 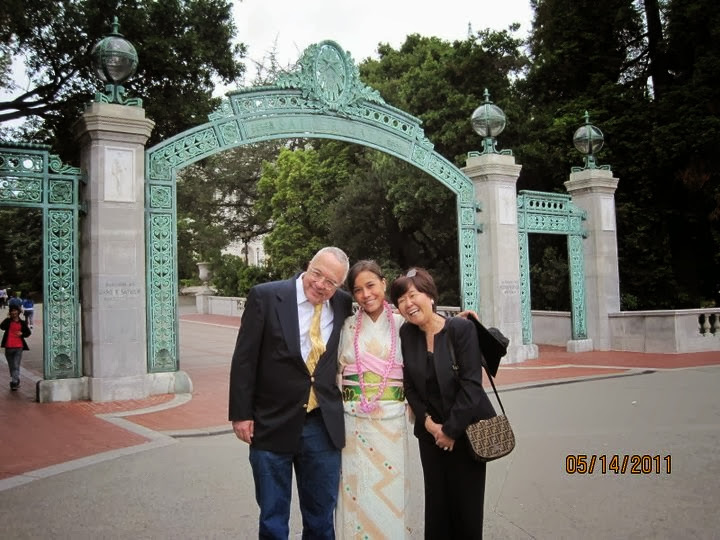 During my year and a half as a Research Scholar at Kyoto University, I was fortunate enough to take numerous courses in the Graduate School of Management, where I met many entrepreneurs such as Mariko Fukui. The ability to interact and collaborate on projects with high-caliber individuals, is such a blessing, and I’m so happy to have been able to have these wonderful experiences. 2. The Sheer Diversity of Foreign International Students! In a previous article, I shared why I truly enjoy living in Kyoto — a city with remarkable diversity of foreign international students. Although my alma mater, UC Berkeley, technically has more international students studying there, the international students only represent 74 countries; whereas, Kyoto university features international students from 110 countries. While the absolute number of foreign international students is fewer than UC Berkeley, the representation of countries, is significantly higher. Moreover, I feel like I interact with a wider range of students from diverse backgrounds on a daily basis at Kyoto University. For 2.5 years, I lived close to campus at UC Berkeley. And yet, I rarely interacted with anyone besides Californian students. However, when I lived for one semester at the international house at UC Berkeley, I was able to interact every single day with people from diverse backgrounds such as Malaysia, Germany, or the Netherlands. But at Kyoto University, I am routinely in classes with students from Indonesia, Kenya, the Philippines, China, Myannmar, Germany, India, Africa, Russia, Afghanistan, etc. I don’t have to seek them out, nor do I have to do anything different than attending classes. Thus, I would have to say that the sheer diversity, is the biggest difference between studying at UC Berkeley and studying at Kyoto University. To reiterate, at UC Berkeley, I had to live in the international dorm to interact with international students. At Kyoto University, I don’t have to do anything else except take classes to interact with people from all over the world. 3. The Delicious Varieties of Restaurants that are Inexpensive and Catered to Students Around Kyoto University! Not only does the university’s cafeteria, serve quite healthy and inexpensive foods, but it also serves Halal food for the Muslim student population. And although Kyoto University’s cafeteria food is quite delicious, one does get sick of it after a while. Fortunately enough, there are quite a few inexpensive and delicious options nearby. Two of my favorite restaurants, offer healthy options for a decent price. For ¥900, you can select a few pasta dishes or a salad, and it comes with a free drink, as well as an all-you-can-eat bread and rice bar. For ¥1000, they have a gratin dish, as well as an omelette and meat plate. Typically, I choose the salad dish, with an inclusive drink and bread bar. It’s one of my favorite places to go right, as it’s right next to campus, and the chef is super welcoming and friendly! For ¥1000, you can get a wide range of delicious salads with 2 small pieces of hard bread — a rarity in Kyoto, as most of the bread is soft. And for around ¥800, you can eat a more hearty French-style sandwich. This place is not well-known to students, so we rarely see students here, but it’s right next to campus, the food quality is superb, and it is quite delicious. Plus, the staff is also quite friendly. 4. The Positive Reputation of Kyoto University in Japan is a Stellar Asset! Anytime I mention to someone that I study at Kyoto University, they always gasp in awe, and then immediately say that I must be extremely smart. Of course, I immediately retort that I just study hard. However, I’m so glad that my school has such a positive reputation. I’ve had some negative experiences of living in Kyoto, where people will belittle me for not knowing something that is quite obvious to Japanese people. For example, during my first winter in Japan, I wanted to purchase a こたつ kotatsu (heated table). But since I’m from America, and we use the US imperial system, and not the metric system, I didn’t know if it would fit in my tiny apartment. Also, I didn’t have a measuring tape at home, so I asked the store clerk how I would know for sure, if it would fit in my room. And she looked at me with a blank stare, and basically said “it says the exact measurements right here.” And I was like “OK...but those measurements mean nothing to me.” Basically, she made me feel like I didn’t know something very basic. Of course, I could’ve googled the measurements to see if it would fit in my room, but I figured there was another way to see if it would fit. Like maybe I could use string to measure around the table, and bring the string home to see how it would fit in my apartment. But in the heat of the moment, and without good Internet, I was at a loss in the store, and just wanted help. So I retorted by saying that I study at Kyoto University, and I’m from America, where we use a completely different system. Plus, I had no measuring tape at home. Afterwards, she became a lot more helpful, after she realized that yes, I was intelligent, but just didn’t understand the metric system. That being said, the vast majority of my experiences in Kyoto have been overwhelmingly positive. Everyone truly respects and admires Kyoto University, so I feel very fortunate to attend such an exceptional University. 5. The Captivating and Down-to-Earth Professors at Kyoto University are Amazing! Since Kyoto university has such a positive reputation in Japan, and there are 9 Nobel Laureate prize winners, this university also attracts a wide range of exceptional and highly-talented professors from all over the world. Plus, the city of Kyoto was the nation’s capital for over 1,000 years, it has 17 UNESCO World Heritage sites, and an amazingly beautiful spring and fall. Furthermore, the cost of living is lower than Tokyo, so many professors want to work in Kyoto. Furthermore, I have been fortunate to attend a variety of school related trips in and around Kyoto such as visiting Keihanna Open Innovation Center — a venture capital and research think tank, the Kyoto Makers Garage — a venture capital company for hardware manufacturers and up-and-coming entrepreneurs, and companies such as Kyocera and Shimidzu. Also, I recently went to Taiwan for 1 week with school, and presented at the National Taiwan University (NTU), and took courses at National Chengchi University (NCCU). The professors who accompanied us on these various exchanges, as well as the field trips, are all very down to earth, have interesting stories to share, and are very passionate about the work that they did do. Thus, one of the things that I love the most about studying at Kyoto University, is the high-caliber of the professors. Not only am I currently taking a course with Professor Sachiko Kuno who has started 3 companies and sold 2, but I have also been fortunate enough to organize 2 trips to Silicon Valley with my supervising Professor, Chihiro Suematsu. In conclusion, while there are many reasons to love both the city of Kyoto and the city’s best university, I offer 5 of my top reasons for loving the fact that I study at Kyoto University. The Ability to Interact with Many Entrepreneurs in the Graduate School of Management at Kyoto University. The Sheer Diversity of Foreign International Students! The Delicious Varieties of Restaurants that are Inexpensive and Catered to Students Around Kyoto University! The Positive Reputation of Kyoto University in Japan is a Stellar Asset! The Captivating and Down-to-Earth Professors at Kyoto University are Amazing!